Here are some thank you cards I was able to get done for the Western theme at OWH. The pattern paper is from the Glasses, Staches, and Ties paper pack by The Paper Studio and the solid card stock is all Core'dinations. 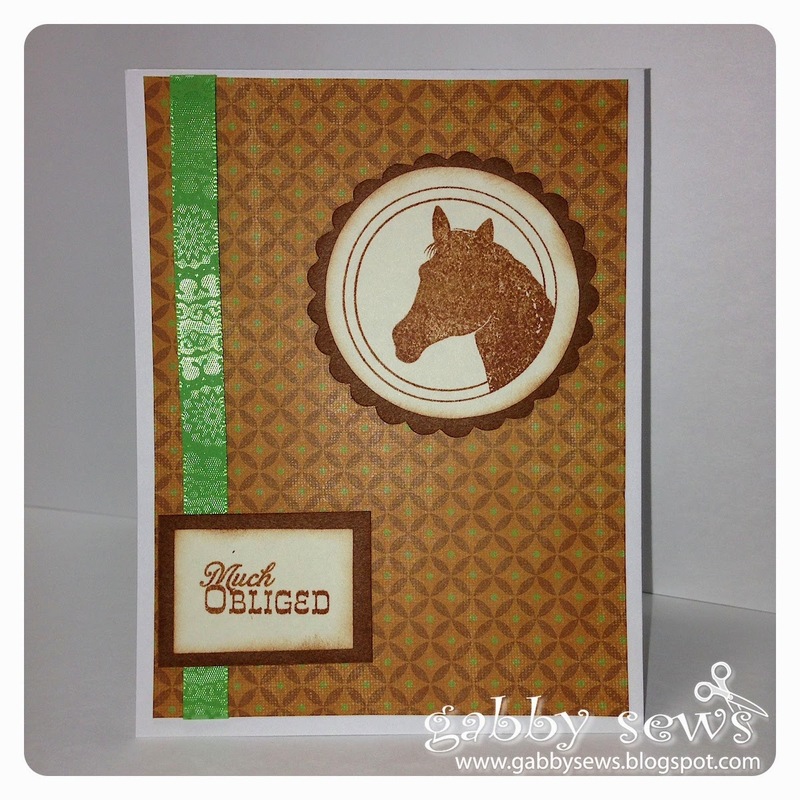 I cut the circles for the horse stamp on my Cricut using the Craft Room Essentials free program. I cut the main circle at 2" and the scalloped circle at 2 1/4". The sentiment is cut at 1 1/2" x 1" and is matted with a piece cut at 1 3/4" x 1 1/4". I used Tim Holtz Distress Ink in Vintage Photo for all the edge inking and stamping. The stamps are all from the My Favorite Things Howdy set. I am loving this set and the stamps themselves are the clearest stamping ones I've ever used. I will definitely be searching out more from My Favorite Things. My box is now complete with 163 cards + 20 AnyHero cards!! Woohoo!! My husband asked me how long it took me to finish this box so I had to go back and look at my first blog entry where I talked about OWH. It has taken me four months to build up this many cards. I feel pretty good about it because I also had Christmas and the big order I do in January for the restaurant I sew for. I also made cards for our friends and family during that time as well as cards for our Compassion International girls. I've been busy but loving every minute of it!